The bruised, beaten, broken, aching, sore head, pain, so you can rest medicine. As martial artists we inevitably get very sore and bruised muscles. Around twenty years ago, I was in a Tai Chi class and the instructor taught me a way to solve or at least diminish all of my martial art muscle pains. In this week’s post I will pass this bit of knowledge onto you: a ginger bath. Take a fresh piece of ginger (dried ginger can be used but I prefer fresh ginger) and cut it up into very small slices or pieces, approximately 1 – 2 tablespoons. If this is the first time you have tried a ginger bath, use at most 1 tablespoon until you find out how your body reacts to the treatment. 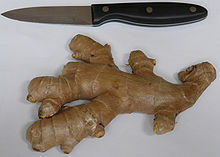 Place the ginger into boiling water and simmer for 15 minutes. While the ginger “Tea” is being brewed, fill a bathtub full of hot water (the hotter the better but don’t burn yourself). Once the tea is finished, pour it into the bath. You might want to pour the “tea” through a strainer (I use a pasta strainer). Then take a bath. Don’t use soap, just soak in the water for as long as you would like. Once you are done, dry off and then completely cover your body with fairly tight fitting comfortable clothing. In other words, wear a full set of pajamas or a soft cotton fleece top and pants, and socks. It is important that all the sore parts of the body are covered. You will then experience what can only be described as hot flashes. These will continue for quite some time. The ginger promotes blood circulation and therefore relieves sore muscles and decrease the amount of time a bruise will last. Repeat daily as necessary. Next PostWhile washing the dishes one should only be washing the dishes! Haha – I took one of these Sunday night after our meeting!! That coupled with some Zen Gu Shui on my bruises and I’m good to go all over again! Too bad we have to wait a month 😦 Nice post Sir! Yes but the bath works much better.